PE0237. ZIG-ZAG (Dave Stamper, Gene Buck & George M. Cohan; de Courville, Pink & Arnould), w.Julian Jones Cond.London Hippodrome Ensemble; Shirley Kellogg (Mrs Albert de Courville), George Robey, Daphne Pollard, Cicely Debenham, Marie Spink & Bertram Wallis. (England) Palaeophonics 126, recorded 1917, Complete, as Recorded, w.Elaborate ‘The Play’ 20pp. Brochure replete w.photos from the London production & facsimile of original brochure. 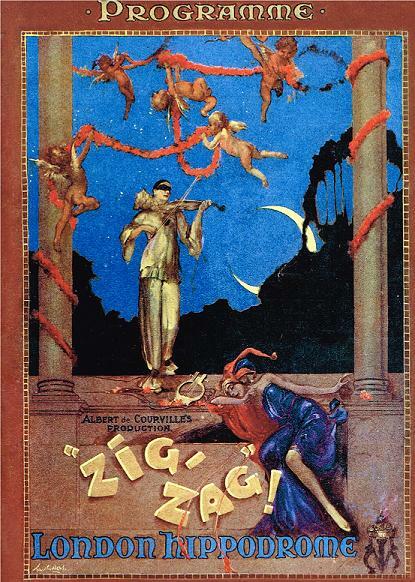 ZIG-ZAG, London Hippodrome on 31 Jan., 1917 and ran for 648 performances. “ZIG-ZAG! 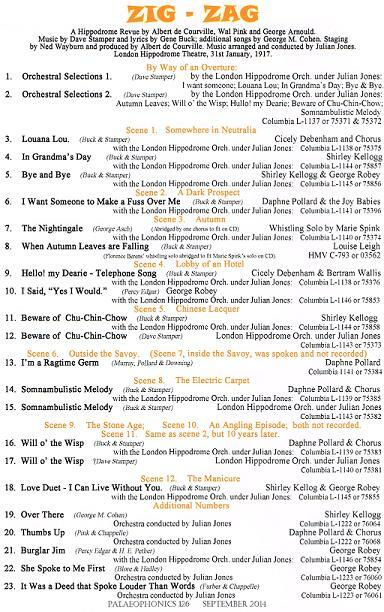 was a revue staged at the London Hippodrome, London during World War I. It was devised by Albert de Courville, Wal Pink and George Arnold, with music by Dave Stamper (with arrangements and orchestrations by the musical director, Julian Jones), lyrics by Gene Buck, and additional songs by George M. Cohan. The revue opened on 31 January 1917 starring George Robey, Daphne Pollard, Cicely Debenham, Shirley Kellogg, Marie Spink and Bertram Wallis. It ran for 648 performances. Robey interpolated a sketch into the show based on his music hall character ‘The Prehistoric Man’, with Pollard playing the role of ‘She of the Tireless Tongue’. In another scene, he played a drunken gentleman who had accidentally secured the box at the Savoy Theatre instead of an intended hotel room. The audience appeared unresponsive to the character, so he changed it mid-performance to that of a naive Yorkshire man. The change provoked much amusement, and it became one of the most popular scenes of the show. During the later half of the war, revues and musical comedies were in great demand; other London hits running at the same time included THE BING BOYS ARE HERE (also starring Robey, who left that show to join ZIG-ZAG! ), CHU CHIN CHOW, THEODORE & CO, THE HAPPY DAY, THE MAID OF THE MOUNTAINS, THE BOY AND YES, UNCLE!. The audiences, which included soldiers on leave, wanted light and uplifting entertainment during the war, and these shows delivered it. Sir George Robey, CBE, was an English comedian, singer and actor in musical theatre, known as one of the greatest music hall performers of the late 19th and early 20th centuries. As a comedian, Robey mixed everyday situations and observations with comic absurdity. Apart from his music hall acts, he was a popular Christmas pantomime performer in the English provinces, where he excelled in the dame roles. He scored notable successes in musical revues during and after the First World War, particularly with the song ‘If You Were the Only Girl (In the World)’, which he performed with Violet Loraine in the revue THE BING BOYS ARE HERE (1916). One of his best-known original characters in his six-decade long career was the Prime Minister of Mirth. During the First World War, he achieved great success in THE BING BOYS ARE HERE (1916) and several other revues. He raised money for many war charities and was appointed a CBE in 1919. From 1918, he created sketches based on his PRIME MINISTER OF MIRTH character and used a costume he had designed in the 1890s as a basis for the character's attire. He made a successful transition from music hall to variety shows and starred in the revue ROUND IN FIFTY in 1922, which earned him still wider notice. By the First World War, music hall entertainment had fallen out of favour with audiences. Theatrical historians blame the music hall's decline on the increasing salaries of performers and the halls' inability to present profitably the twenty or thirty acts that the audiences expected to see. Revue appealed to wartime audiences, and Robey decided to capitalise on the medium's popularity. Stoll offered Robey a lucrative contract in 1916 to appear in the new revue THE BING BOYS ARE HERE at the Alhambra Theatre, London. Dividing his time between three or four music halls a night had become unappealing to the comedian, and he relished the opportunity to appear in a single theatre. He was cast as Lucius Bing opposite Violet Loraine, who played his love interest Emma, and the couple duetted in the show's signature song ‘If You Were the Only Girl (In the World)’, which became an international success. Robey left the cast of THE BING BOYS during its run, in January 1917, to star at the London Hippodrome in Albert de Courville, Dave Stamper and Gene Buck's lavishly-staged revue ZIG-ZAG!. ZIG-ZAG ran for 648 performances. Stoll again secured Robey for the Alhambra in 1918 for a sequel, THE BING BOYS ON BROADWAY. The show, again co-starring Violet Loraine, matched the popularity of its predecessor and beat the original show's run with a total of 562 performances. Robey returned to the London Hippodrome in 1919 where he took a leading role in another hit revue, JOY BELLS. Phyllis Bedells took over from Pollard as his stage partner, with Anita Elson and Leon Errol as supporting dancers. Robey played the role of an old-fashioned father who is mystified over the changing traditions after the First World War. He interpolated two music hall sketches: ‘No, No, No’ centred on turning innocent, everyday sayings into suggestive and provocative maxims, and ‘The Rest Cure’ told the story of a pre-op hospital patient who hears worrying stories of malpractice from his well-meaning friends who visit him. In the Italian newspaper La Tribuna, the writer Emilio Cecchi commented: ‘Robey, just by being Robey, makes us laugh until we weep.… Robey's aspect in dealing with his audience is paternal and, one might say, apostolic.’ JOY BELLS ran for 723 performances. During the run of JOY BELLS he was awarded the Legion of Honour for raising £14,000 for the French Red Cross. He declined a knighthood that same year because, according to Cotes, he was worried that the title would distance him from his working-class audiences; he was appointed a CBE by George V at Buckingham Palace instead.